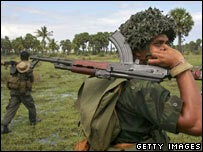 The ceasefire declared in Sri Lanka between the government and the Tamil Tiger rebel movement has disappeared in all but name. International mediation has floundered and fighting has flared up again in the north and east of the island, where the Tigers want to carve out a separate Tamil state. I have always liked Bullers Road. I used to live on a lane about halfway down. It is one of the few places in Colombo where you can still walk under a thick canopy of old mara and mayflower trees. Tall, dense and dark green, they used to cover most of this part of the city, offering protection from the excessive heat of the midday sun. Only a few trees remain. And even they could not help protect Professor Sivasubramaniam Ravindranath. An agricultural scientist, he is the vice-chancellor of the Eastern University in Sri Lanka's troubled Batticaloa district. But last month he was abducted on Bullers Road in broad daylight. Despite international appeals for information, and for his release, he has not been seen since. Who took him, and why? Well no-one knows for certain. But the talk around town is that it was members of a breakaway faction of the Tamil Tigers known as the Karuna group - now bitterly and bloodily estranged from their former allies. Instead, they co-operate with the Sri Lankan armed forces, and receive their protection. Professor Ravindranath is not the only victim. In what feels like a climate of increasing political impunity, Tamil businessmen are being kidnapped for ransom. Rogue elements of the security forces are probably involved. In Colombo many people are gloomier - and in some cases more scared - than I have seen them for a long time. In the north and east there has been shelling, bombing and civilian deaths. Just north of Batticaloa, tens of thousands of people have been forced to flee, caught in the fighting and ravaged by an epidemic of the Chikungunya virus. 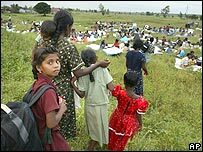 In the Sinhalese south in recent days, bombs on buses, more civilian deaths. When, they ask, will the next attack in Colombo come? And which way will the president turn? 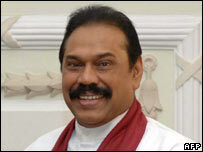 Mahinda Rajapakse was only elected last year. I first came across him more than 15 years ago. I was a young BBC reporter on my first foreign posting - he a member of parliament standing up for the rights of southern civilians, caught between a brutal Maoist uprising and an equally brutal military response. Now he has risen to the top of the political tree backed by Sinhalese nationalists. He has packed the presidential mansion with family members and favourites. And he is trying to create a political dynasty. At De Zoysa Circus, a busy road junction next to Colombo's General Hospital, a large billboard of the moustachioed president stares down at passing motorists. It is not the image which attracts my attention though - it is the slogan which accompanies it: "He is our leader," it proclaims, "he is our president, he is next to King Dutugemenu." Now every Sri Lankan child knows the legend of Dutugemenu, the mighty Sinhalese king who ruled more than 2,000 years ago - the warrior who went into battle on his elephant to conquer and defeat the usurping Tamil king Elara. The symbolism of the story is potent, and relevant. Where many Sinhalese see an old-fashioned hero who unified the island, many Tamils see the deification of Dutugemenu as proof that the majority community is determined to dominate the whole country. And politicians are playing to the gallery. "I've never known a government," muttered one Colombo old hand, "which has fallen into ethnic chauvinism so quickly." There are different voices whispering in the presidential ear. Some of them, seduced by the trappings of power, are urging him on to all-out military victory over the Tamil Tigers - a solution often promised, never delivered. Others say no, it is time for a bold political offer to resolve the ethnic conflict once and for all. If the Tigers refuse to compromise on their objective of a separate state - and well they might - their intransigence will stand exposed. So which path will Mr Rajapakse follow? Who will he listen to? Big questions, no obvious answers yet. But there has always been one place to which Sri Lanka's political leaders have turned for advice: astrology. One previous president - Premadasa - hardly got out of bed before hearing the astrologers' prognosis. And on the day he died, victim of a Tamil suicide bomber, the advice from the planets had been to stay indoors. Well, the astrologers are predicting another turbulent year. February and March, they say, are looking particularly unstable. This beautiful island could and should have the world at its feet. If only it could stop the killing. I wish I could be more optimistic. I love this place. But whether you believe it is written in the stars or not, this is a nervous worrying time in Sri Lanka - not an especially Happy New Year. And as for the whereabouts of the vice-chancellor from Batticaloa... for the moment, not even the astrologers could shed any light on that. From Our Own Correspondent was broadcast on Saturday, 20 January, 2007 at 1130 GMT on BBC Radio 4. Please check the programme schedules for World Service transmission times.